r Question: “My father is going through early onset Alzheimer’s and I am watching the financial and emotional stress it is taking on him and my mother. I can only imagine if that happened to my wife and I while we trying to care for our son with autism. What can we do? Define your vision and needs and your son’s needs for the rest of your and his lifetime. It can be quite a financial challenge to pay for your own long term care needs and then ensure your son has enough assets to live on for his lifetime. In the past, there was only one choice for Long Term Care Insurance, which was a long term care insurance policy that covered the cost of care in a nursing home, assisted living, or in your home (care was provided by a licensed home health care professional and overseen by a physician). However, over the past few years, more options have arrived that should also be considered. As with all areas of planning, please research thoroughly before moving forward, and consult professionals. 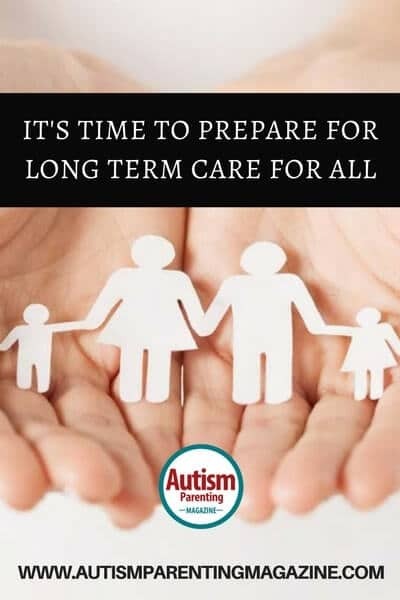 Due to the intricacies of this type of planning, it is critical to have a qualified special needs advisor create a plan, and then educate you on all the options that make sense for your family. I’m 44 years of age and still live with my elderly parents.